There are lot of Masterpages available in out sharepoint designer, I want to update something in our current masterpage, but I'm unable to find which one we are using now. I tried to click right click on masterpage and check set as default option is not getting on which masterpage, but it's showing that option to more than 6 masterpages, So is there any other simple way to find?? Suggestions will be highly appreciated, thanks in advance. Hit following URL in your browser. You will get following response. Make a GET request using this REST Client to above URL. It will show response in JSON format. You find the which page is applied. Not the answer you're looking for? Browse other questions tagged sharepoint-enterprise sharepoint-designer or ask your own question. 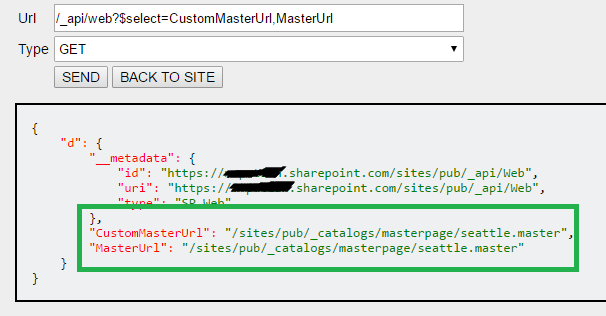 How to control the Masterpage dropdown options on Sharepoint 2013 composed looks? How to Share a document with Read Permission Level? How do I run SharePoint designer 2013 as a different user?